The U.S. engagement in Afghanistan, including the 30,000 “plus-up” currently underway, represents one of the most difficult logistical challenges in the annals of war – a challenge even for the United States, which is the world champion of supply solutions. 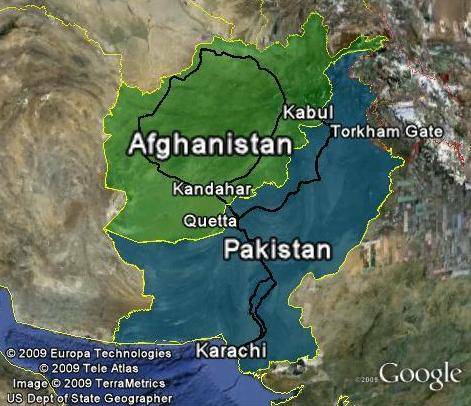 Afghanistan is harder than the Vietnam “land war in Asia” or the Berlin airlift or Iraq I and II. These previous engagements, although difficult logistically, pale in comparison to the task of supplying 100,000 troops and as many contractors in Afghanistan over nine years and counting. Landlocked, mountainous, beset by civil war, banditry and extreme underdevelopment, Afghanistan is surrounded by a clutch of hostile, suspicious, barely functioning sovereignties. And U.S. and allied troops require a Herculean mass of supplies from ammunition to toothbrushes, fuel, computers, night-vision goggles, concertina wire et cetera, et cetera – at the rate of thousands of tons per day. Even with the containerized packing systems and all the technology that made-in-USA delivery systems have made available to the military, the traffic volumes are immense. In 2008, nearly 30,000 containers were sent to the front – or about 75 percent of the total need in fuel, food, equipment and construction materials. Traffic reportedly doubled in 2009, and the requirements for 2010 will likely double again. Part of this massive resupply travels by air in giant military transports (some American, some Antonovs leased from Russia): for example, the tons of ammunition, from small artillery to missiles, is delivered entirely by aircraft landing at military air fields. But the bulk of the traffic must be carried by sea-lift, mainly cargo ships that dock in the Indian Ocean port of Karachi in Pakistan, and then are off-loaded onto trucks. The road north is a hazardous trip of nearly 1,000 miles, finally passing through the difficult and often-hostile terrain of the Hindu Kush and then over the treacherous Khyber Pass before finally dropping down into Afghanistan. Because of Pakistani sensitivities about sovereignty, these trucks are 100 percent civilian-operated, with no military escorts. The pay is good but the work is dangerous. Drivers are subject to kidnapping, ransoming, and destruction by roadside bombs or rocket and bazooka ambushes. U.S. sources report that over 450 trucks were destroyed in 2009, and one international shipping company confirms to European Affairs that 50 of its trucks were attacked, many of them fatally. Pilferage has been a problem too, both in Pakistan and Afghanistan. Karachi itself is a hotbed of political unrest rife with strong pro-Taliban currents: cargo ships and oil tankers have been sabotaged in the harbor. Not surprisingly, the U.S. military logisticians have sought a better way – or at least an alternative one affording a route around the potential choke-point in Pakistan. Pentagon planners started their quest for an alternative to Karachi as early as 2006, when the U.S.-led campaign there was still a comparatively low-level grind and well before there was even a blueprint for the current surge. Gradually, stage by stage, U.S. officials stitched together a series of deals for rights of passage, crucially with Russia and other nations around Afghanistan. Largely under-reported and unnoticed by the public at the time, these bilateral accords finally took shape as a whole by mid-2008 in what the U.S. military has dubbed the “Northern Distribution Network (NDN).” In fact, the NDN comprises several itineraries, commencing at one of two “western hubs” in Latvia and Georgia. 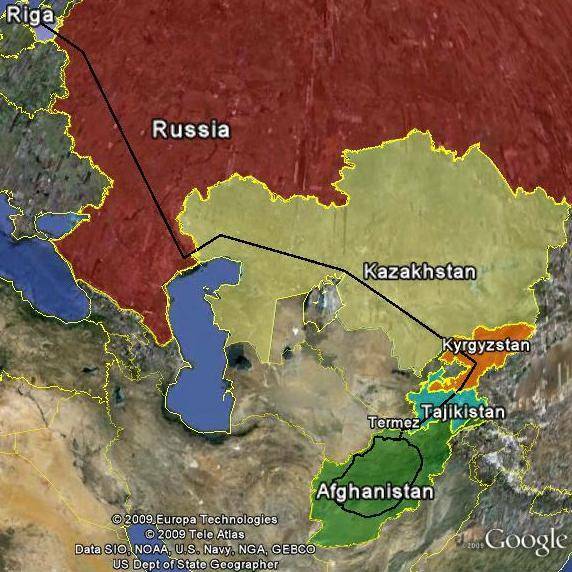 From these secure jumping-off points, the cargo goes by combinations of trains, trucks and ferries across Russian territory and the adjacent ex-Soviet “stans” to enter Afghanistan from the north. All of the new routes share the same attraction of altogether avoiding Pakistan. Taken together, these new routes in the NDN provide redundant paths for overland supplies that, however expensively, make it logistically sustainable for the U.S. and its allies to wage their Afghan campaign. The most important new route, the “northern route” (see map), starts in the Latvian port of Riga, the largest all-weather harbor on the Baltic Sea, where container ships offload their cargo onto Russian trains. The shipments roll south through Russia, then southeast around the Caspian Sea through Kazakhstan and finally south through Uzbekistan until they cross the frontier into north Afghanistan. The Russian train-lines were built to supply Russia’s own war in Afghanistan in the 1980’s, and today Moscow’s cooperation is making them available for use by the U.S. and NATO in their own Afghan campaign. The NDN also involves two additional routes. A “southern route” transits the Caucuses, completely bypassing Russia, from Georgia. Starting from the Black Sea port, Ponti, it travels north to Azerbaijan and its port, Baku, where goods are loaded onto ferries to cross the Caspian Sea. 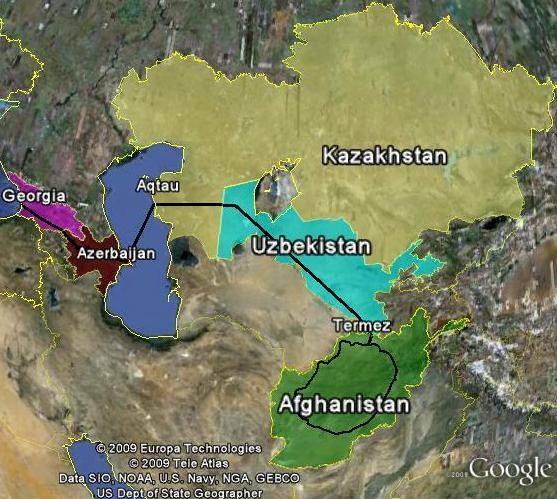 Landfall is Kazakhstan, where the goods are carried by truck to Uzbekistan and finally Afghanistan. This southern route now carries about one-third of the NDN’s traffic volume. While shorter than the northern route, it is more expensive because of the on-and-off loading from trucks to ferries and back onto trucks. A third route, which is actually a spur of the northern route, bypasses Uzbekistan and proceeds from Kazakhstan via Kyrgyzstan and Tajikistan, which has a northeast border with Afghanistan. This route is hampered by bad roads in Tajikistan. Not available to the U.S. for obvious political reasons is the most attractive land route into Afghanistan – through Iran, which has a 600-mile border along Afghanistan’s western provinces. The best line would begin at the Iranian port of Chabahar on the Gulf of Oman, at the mouth of the Persian Gulf, and proceed over excellent roads to the Afghan border city of Zaranj, which is connected to the main trans-Afghan highway by a recently completed road. Although the U.S. cannot use this route, other countries including European nations (among the 42 countries that have forces in Afghanistan) can take advantage of it, using private hauling companies to handle some non-lethal cargo. And as remote as it may seem today, a shift in U.S.-Iranian relations is a contingency to consider. As of November 2009, the NDN had delivered 4,500 containers, and through-put on this route could easily double this year. As of now, the NDN routes are not only longer but also more expensive than the connection via Pakistan, but they are also safer and, despite the distance and border crossings, more reliable. U.S. Central Command, in charge of the Afghan campaign, would like to be able to move a third of the surface traffic over the NDN in the future. Despite its signal success in establishing the new system, Washington has not trumpeted its accomplishment, perhaps it fears there might be a higher political price in drawing attention to the fact that the ongoing flow via the NDN depends on continuing cooperation with Russia and Uzbekistan and other “stans” that have often exhibited shaky relations with the U.S. Relations were recently strained with Uzbekistan, for instance, over human-rights issues with that country’s ruler. And given the ebbs and flows of U.S.-Russia relations, the reliability of continued cooperation from Moscow is not insured.. The issues and opportunities raised by the new routes have recently been well ventilated by reports prepared by the Center for Strategic & International Studies (CSIS) [www.CSIS.org], a think-tank in Washington. CSIS initiated its thorough-going, politically sophisticated study a year ago after a senior CSIS executive, Arnaud de Borchgrave, was briefed on the subject over dinner by General David Petraeus, the top U.S. military commander in the theater. The new routes are difficult and long, but they offer incontrovertible security advantages over the routes through Pakistan – an option that invited Taliban commanders to see the road as a long, exposed jugular vein of the U.S. force in Afghanistan. And there must be a surface route because air shipments to Bagram, the main Afghan airfield, cost $14,000 a ton, a prohibitive price tag. Even if Washington were ready to pay whatever it costs, air lift capabilities are already being strained (including those of civilian contractors) by the task of simply delivering weaponry and other “sensitive” materials. This air route also involves over-flight permissions that need to be secured (and often renegotiated frequently): in Kazakhstan, for example, U.S. access to the large airfield at Manas has been an on-and-off option that now seems to be “on” after bargaining that led to a fourfold increase in U.S. aid assistance to that country. Russian assistance is obviously crucial, and that U.S. dependence on Moscow always raises some eyebrows in the security-policy community in Washington among people who worry that Moscow may someday take advantage of the leverage it has gained thanks to the NDN running across Russian territory. Proponents of the NDN contend that the route is an example of cooperation between the U.S. and Russia (and the European Union) that offers advantages to all three parties and could help pave the way to more such “triangular cooperation.” In any event, the U.S. needs this alternative so direly that it is worth some political risk, according to Obama administration officials. Russia has strong incentives not to hit the “off switch,” they add. Similarly, CSIS concluded that the Russian position is accurately formulated by Zamer Kabulov, the Russian ambassador to Afghanistan and a veteran of the Soviet war in Afghanistan, when he told the Times of London: “it’s not in Russia’s interest for NATO to be defeated and leave behind all these problems…we’d prefer NATO to complete its job and then leave this unnatural geography.” Of course, from Moscow’s vantage, the issues could be seen as a reprise of “the Great Game,” the long-running 19th Century struggle between Britain and Russia for control of central Asia that may be revisited in coming decades between Russia and U.S.-led NATO in the region. Last summer at the U.S.-Russian summit conference Russian President Dmitry Medvedev and U.S. President Barack Obama signed a significant military transit agreement that covers not only the overland routes across Russia but also over-flight permissions. Contracts for Russian transport on Russian military aircraft of non-lethal supplies, which proceeded without pause during the Russia-Georgian war, will also be continued. The agreement permits the movement of both soldiers and military supplies overland. The White House indicated the new transit routes would save at least $133 million annually in fuel, maintenance and other transportation costs. Opening the new routes has been a quiet triumph of the U.S. military and diplomatic corps. The U.S. Central Command continues working to expand the supply routes to multiply the military options and cope with the additional logistical demands of 30,000 more U.S. troops and 10,000 more European and other allied reinforcements. With the arrival of these numbers and also more contractor corps that use the military resupply system, there will be a short term “bow wave” effect as infrastructure and pre-positioning supplies for the expansion moves to the area. Civilian policy observers see a potential long term gain for the U.S. in taking a leadership role in re-establishing the Silk Road that once brought thriving commercial life to Afghanistan and beyond. The NDN could also create a positive collateral effect of re-establishing a “Modern Silk Road,” which boosters say would contribute to the long term economic development of Afghanistan and surrounding countries. The new routes could presage a Modern Silk Road (“MSR”) if the routes opened for the military convert into civilian commerce and enhance regional prosperity for the adjacent central Asian nations. .
Bill Marmon is Assistant Managing Editor of European Affairs.